The banquet hall of the Sheraton Park Hotel in Anaheim overflowed with hundreds of Disneyland Resort workers. They gathered last night to hear the findings of “Working for the Mouse,” an Occidental College and Economic Roundtable study that finally let the rat out of the bag this week about Disney’s poverty wages. The Coalition of Resort Labor Unions (CRLU) also organized the town hall to fire up a clarion call. 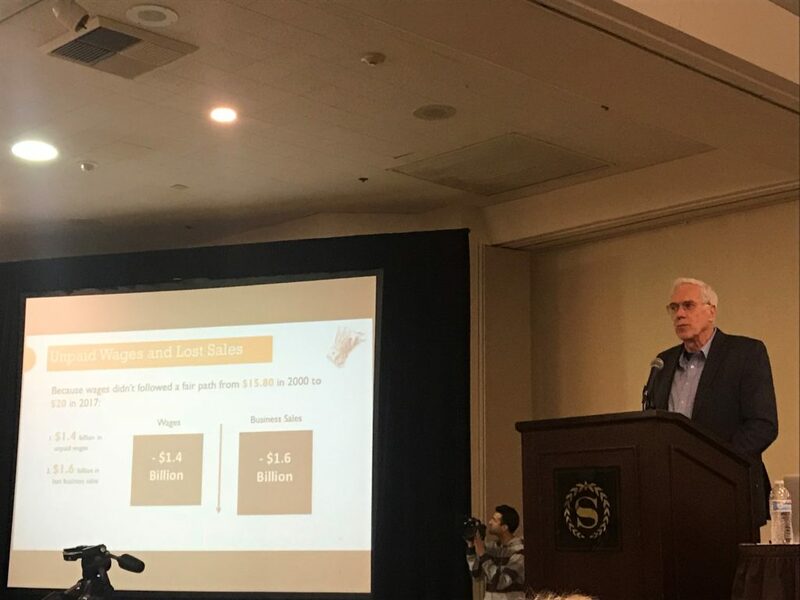 They announced a new ballot measure campaign to raise the living wage for subsidized companies in the Anaheim resort to $15 per hour starting in 2019. Occidental College professor Peter Dreier and Los Angeles Economic Roundtable president Daniel Flaming, who co-authored the report, validated worker experiences like those of Torres in explaining their findings. Dreier noted the 5,000 workers who participated in the living conditions survey last fall as a remarkable response rate. “Eighty-five percent of you make less than $15 an hour,” Dreier said. “Over half of the people that have worked at Disneyland for over 15 years are still earning less than $15 an hour.” The audience loudly booed the statistic. “Slaves!” one worker shouted. “Overworked” yelled another. Flaming followed by pointing out that Disney ranked as the 52nd largest employer in the United States and is its 22nd most profitable corporation. He spoke about the enormous pay gap between Disney CEO Robert “Bob” Iger and the average worker. “Last year, Robert Iger was paid $36.3 million dollars,” Flaming said, an amount equal to 2,000 Disneyland workers. “This year, Mr. Iger is authorized to receive pay of $162.5 million.” More boos sounded from the crowd. “Bob Igor!” one man shouted. The Economic Roundtable president explained that for a family of four in Orange County, a living wage amounts to $23.94 an hour. “We don’t make half that!” a worker yelled out. “Nobody does!” said another. Representing 17,000 workers, the coalition formed last year as an effort to better the lives of its members as a united front. “Without you, there is no Disneyland Resort,” said Steve Rosen, the West Coast Business Representative of the American Guild of Variety Artists. “Together we have power. For years, Disney says, ‘This is what we’re giving you, take it or leave it.’ You know what? Those days are over.” Cast members erupted in applause. Rosen’s fiery speech helped set the tone for the next step in the struggle over better wages in the Disneyland Resort. Looking beyond the next round of contract negotiations, the coalition is hoping to take Disney’s poverty pay to the ballot box. “I’m proud to tell you that our union coalition has the solution,” said Ada Briceño, co-president of Unite HERE Local 11. 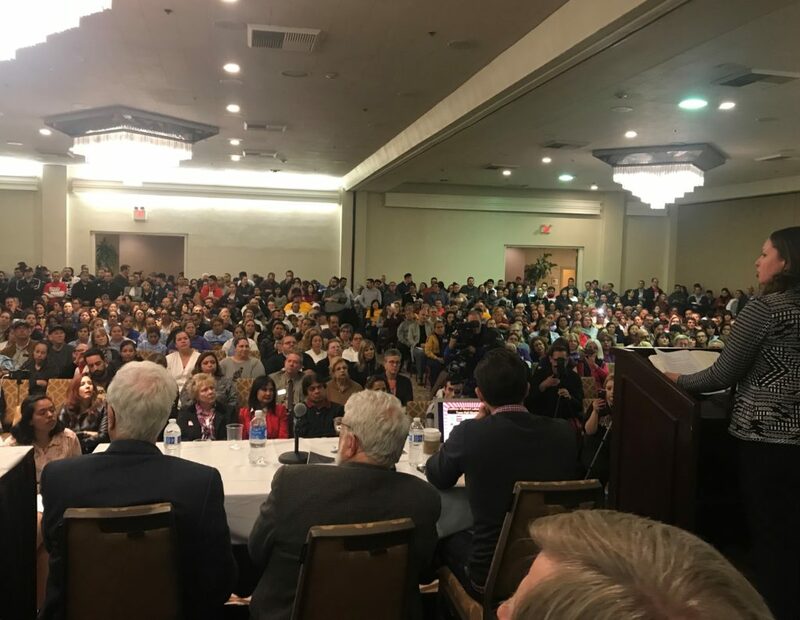 “We have decided to fight for a measure that would require all Anaheim Resort businesses that receive a taxpayer subsidy to pay their workers a living wage!” The fervor of the crowd reached an apex with the announcement. 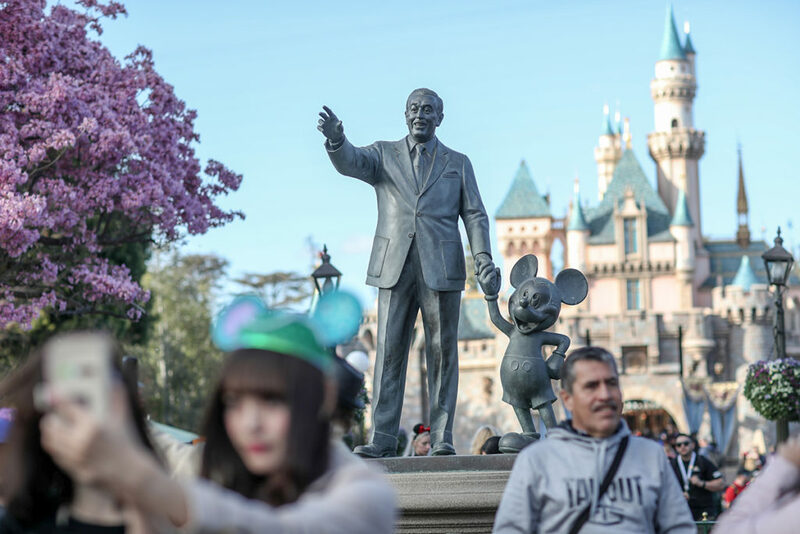 Briceño added that the measure would raise all Disneyland Resort wages to $15 per hour as a starting point with commensurate minimum wage increases to follow. “We know we deserve much more, but this is just the beginning,” said Briceño. The campaign begins this morning at Anaheim city hall where coalition officials will formally file the ordinance. Afterward, the hard work of gaining enough signatures to qualify for the November ballot begins. “On or after January 1, 2019, an Employer shall pay a wage of no less than Fifteen Dollar per hour, which shall increase by One Dollar per hour on each January 1 thereafter through January 1, 2022,” the ordinance reads. Once the minimum wage reaches $18 per hour in that time frame, annual increases will follow cost of living adjustments. Three candidates for Anaheim mayor–Ashleigh Aitken, Lorri Galloway and Cynthia Ward–attended the town hall. “I think they should have asked for $20 per hour,” Ward, a Republican ally of current mayor Tom Tait, told the Weekly. She agreed with the study’s argument that low wages equated to a monumental loss of purchasing power that could have been spent in the economy, a popular notion held by sectors of the business community that favor minimum wage increases. “If anybody can make that happen, it’s the people in this room. There’s a very powerful feeling in this room that I’m very proud of.” The Weekly couldn’t reach Democrats Aitken and Galloway for comment at the event. Gabriel San Roman is from Anacrime. 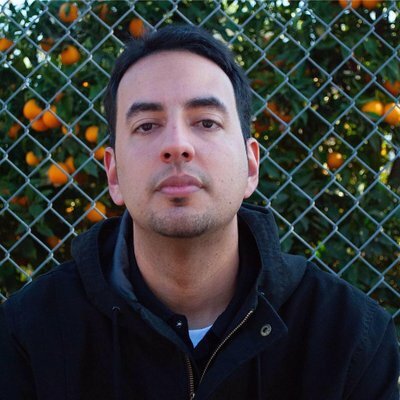 He’s a journalist, subversive historian and tallest Mexican in OC.